We’re approaching the end of another busy year for the mobile advertising industry, which means it is a perfect opportunity to take a look back at the biggest stories, shifts and trends within the sector. But what did we think were the biggest mobile advertising trends and stories this year? Here are four of the most important developments across the sector across the year. The introduction of the General Data Protection Regulation (GDPR) regime in Europe earlier this year was both one of the biggest developments and causes for concern for the industry in 2018. On paper, GDPR looked worrying for many mobile advertising businesses. The combination of increased individual rights for users and elevated legal responsibilities for data processors and controllers looked as if it could pose a major challenge to mobile advertising businesses. However, the industry appears to have more than weathered that storm. The Internet Advertising Bureau (IAB) showed that advertising spend was up 10% in H1 2018 in Europe, meaning that mobile ad spend crossed the €10bn mark in a half year for the first time on the continent. Furthermore, companies such as Apple embraced GDPR wholeheartedly leading to the European standard for data processes to become something of a global standard for digital businesses. This provides a stronger basis for long-term industry growth than the previously unregulated – and in many ways unpoliced – landscape that went before it. One of the other defining stories of the mobile advertising industry in 2018 has been Facebook’s reputational battering. Since the Cambridge Analytica scandal– which saw data from over 50m Facebook users harvested without permission for the purposes of building a system to analyse voting intention – broke in March 2018, Facebook has been on the receiving end of a number of damning stories. From Mark Zuckerberg being forced to provide evidence to a US government panel to the British parliament seizing documents to help it determine Facebook’s impact over political processes, the company’s historically lax approach to personal data has landed it in hot water. And, most importantly of all, that is hitting its bottom line. 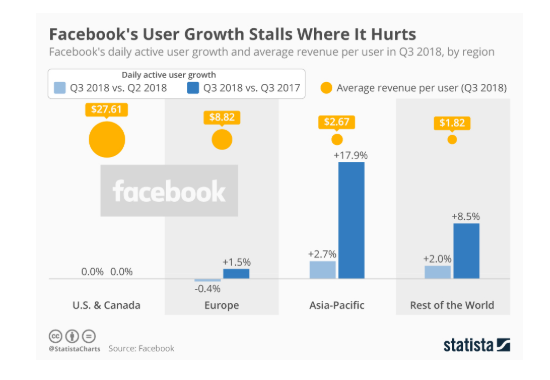 Although Facebook has still posted strong revenues and earnings, Q2 2018 was the slowest quarter for growth in the company’s history and Q3 2018 saw the company miss its daily active user and monthly active user growth counts. So if we see GDPR as one side of the coin when it comes to user trust, it is arguable that Facebook is on the other side. And if there’s one thing that we can conclude from Facebook’s comparative struggles is that it is increasingly becoming bad for business to be seen as treating user data lightly. As if Facebook didn’t have enough to be concerned about in 2018, both it and Google have had to contend with the potential end of their duopoly due to a concerted charge into advertising by Amazon. 2018 has marked the year where the retail giant has made a meaningful move into the mobile and digital advertising space. Since it consolidated its in-store advertising offering, DSP and bespoke opportunities into a unified Amazon Advertising business, it has posted consistently impressive revenue growth. For example, the company saw a 222% increase in revenues in its advertising business in Q3 2018. 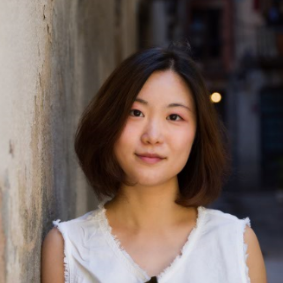 This growth has turned it into a multi-billion dollar annual business, putting agencies and advertisers on high alert to a new way to effectively reach consumers. Of course, Amazon still has a long way to go to challenge either Facebook or Google. Its ad revenues remain a fraction of the big two and will likely remain so if it doesn’t clarify and consolidate its advertising offerings further. 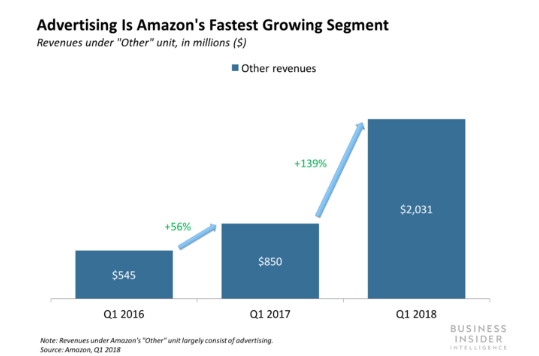 Nevertheless, Amazon’s emergence into the mobile and digital advertising space is notable and should be watched closely in the future. Derived from a technique used within header bidding in desktop, it changes the way that bidding for advertising in real time works. Instead of following the previous “waterfall” approach – where advertisers would have a place in a queue of advertisers based on historical spend – in-app header bidding allows bids from different demand providers to land simultaneously. This allows the bidding system to pick what is genuinely the highest value bid for a particular advertising slot, rather than picking what the system assumes to be the highest value based on historical data. 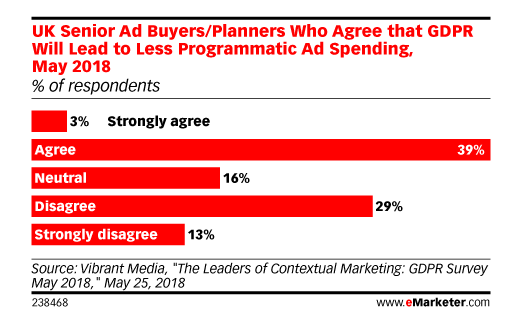 This is an important development for the sector because it is likely to make programmatic even more efficient than it already is. 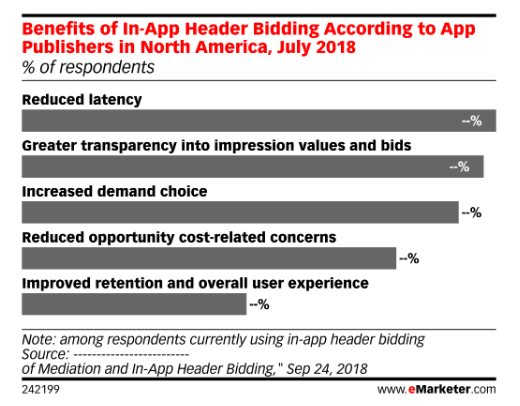 Publishers that have used in-app bidding services provided by Facebook have already seen yields increase by up to 20%, suggesting a greater return for companies abandoning waterfall approaches. There are barriers to its adoption still. As with all advertising technology, app creators using in-app header bidding will need to weigh up the challenges of integrating multiple SDKs for in-app header bidding providers versus running a one-stop shop mediation service with (potentially) fewer partners. 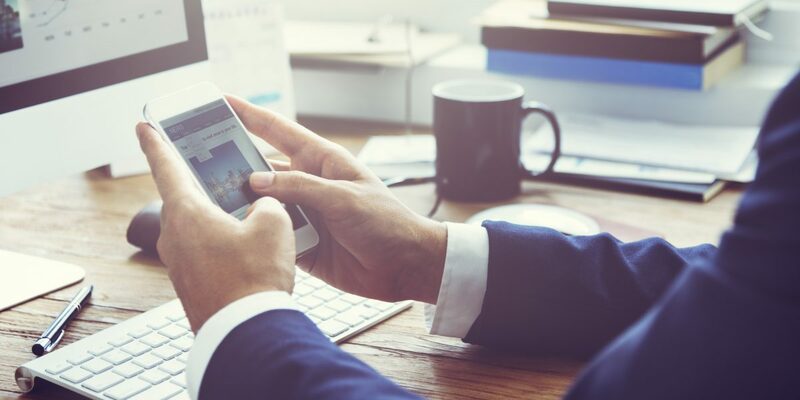 But with the mobile market continuing to be as competitive as ever, the emergence of in-app header bidding as a widely used mobile advertising mechanic may help more publishers to thrive in the future. Keep up to date with all the latest mobile advertising news and views by subscribing to our mailing list .